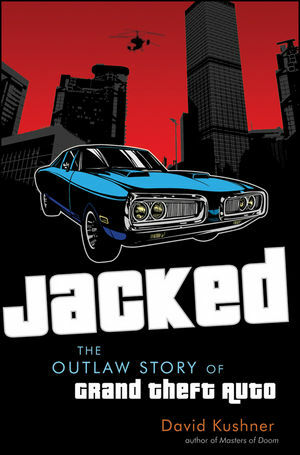 Before anything else: Jacked: The Outlaw Story of Grand Theft Auto is a book written by David Kushner that sets out to tell the story of the Grand Theft Auto franchise from its beginning to its end. It succeeds in that if “succeeds” means that it gives the reader some information that can causally be strung together in order to create an origin story. The book follows Sam and Dan Houser (and various other figures who I could never manage to keep straight) along the path from relative obscurity to massive success and massive mental breakdown while making the claim that the Grand Theft Auto series of games might be the most significant one in games history. Parallel to this, the book follows well-known game hater Jack Thompson, the Floridian lawyer who took Rockstar to task for their games until he was finally disbarred. 1. Why the first sentence? I’m quoting the paragraph in full. There isn’t any explanation of why Jack is a “ripper” here, other than clever wordplay and rhetorically painting Thompson as someone who is unreasonable, violent, etc. Frankly, this is par for the entire book–Kushner has a way of presenting people and events with clever language that either never gets delivered on or just straight-up doesn’t make any sense. 2. Jack Thompson only exists in the book because he is the other side of a First Amendment argument. In order to protect children, Thompson believes that certain sexual, violent, and linguistic content needs to be limited in media that children could possibly see. So why this anecdote? Thompson apparently becomes a conservative because “political correctness,” but then spends the rest of the book waving the flag of censorship high. The anecdote is against both Thompson’s characterization and message for the remaining 230 pages. So why include it? I don’t have any love for Jack Thompson, but I do think that he deserves a much fairer shake than the one he’s given in the book. Thompson is presented from the start as a villain while the culture and designers at Rockstar are treated like true heroes of the people. My larger problem with the book is that latter point: Rockstar are a perfect distillation of all of my issues with the video game industry. Near-constant crunch on core titles eventually lead to lawsuits against the company. Employees were internally ranked by being given patches, jackets, and sweaters to signify their importance. The years of development of the Grand Theft Auto series are punctuated by huge, expensive celebrations with strippers, booze, and cheese ball eating contests where participants are encouraged to vomit to remain competitive. People are literally chewed up by the machine–one chapter of the book explains that there was a stabbing and two suicides at Rockstar during a single year. None of this is questioned. It is all presented, probably not intentionally, as casualties on the road to progress. Every game gets a multiple page explanation of why it is qualitatively better than the games that had come before it, and never do we get a sentence to the effect of “were those parties and those accolades worth destroying the lives of hundreds of unnamed developers?” For the most part, everyone who was never a corporate head at Rockstar or a lead designer is left unnamed, and while we’re told that there is roughly a 50% gender split at Rockstar (I am incredulous of this), I don’t believe there is a single woman developer or designer named in the entire book. So if you want to read another sycophantic book that explains why some white, male, overpriviledged multimillionaires are geniuses, you could do worse than reading Jacked: The Outlaw Story of Grand Theft Auto. I wouldn’t bother. This entry was posted in Video Games and tagged david kushner, grand theft auto, review, video games. Bookmark the permalink. If you’re not a fan of Rockstar, you’re not going to enjoy this book. But if you love the company this book tells a thrilling story of how one of the most influential game developers in all of history came to be. It’s a great read. Jack Thompson is a crackpot. He was disbarred for being a crackpot. No one takes him seriously. I like Rockstar games just fine, and I don’t like Jack Thompson whatsoever, but just because I agree with the core principles of the book doesn’t mean that the book is in any way a good read.